AMP-22 Free AMP Blogger Template You Can Chose, Although not as much as a regular blog template but you can choose one of the 22 blog templates that are here. For reasons why using AMP templates I think my friends are all better understood than admin sukaraja. So what are the options of free AMP templates available? Let's see what we got. This template is also original bro Adhy also From Indonesia, although it is free there is also a premium version, if my friend want a premium please contact Mr Adhy, with a look that is skewed to this minimalis this free Kompi. This template is more designed to display images on the home page, so if you want a template that the majority of images then the AMP touch template will match your blog. 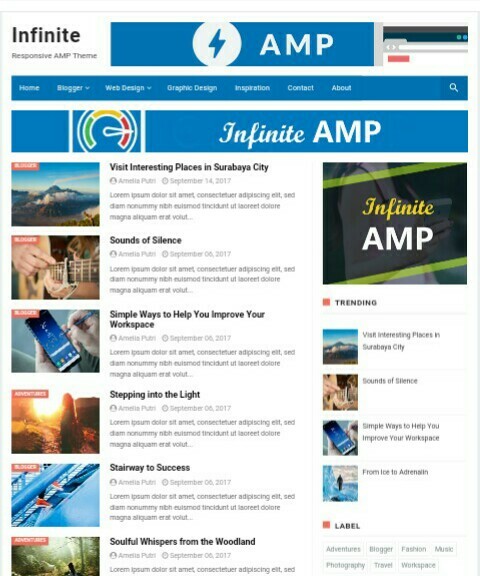 Almost the same as Templte AMP Touch, it is designed to display images on the home page, so if you want a template that the majority of images then the AMP Blog Build template will also match your blog. If you want a simple template, it seems droid buzz is suitable to be an option. The look is also neat and clean, does not hurt when in this template a bit longer. Templates AMP to 6 we can be a faforit for those who like the neatness and simple, also with the Navigation menu of a compact remote from the complicated and troublesome sebagiam template that sudab there. In order to 7 it seems suitable for my friend who loves an elegant template with type 2 column that will spoil the eyes of the visitors who stop at your blog. From the name of this template is more suitable for my friend who gives updates regularly on blogs that you manage, like a news blog updated. In the order of nine pal can see this theme which became one of my faforit, and already in pairs on blog sukaraja.com for 3 months more and it seems still comfortable with this template. This template is quite simple and interesting if you want to see more carefully, with simplicity and flexibility will attract the visitor's eyes to feel at your blog. One more template made by Bro BungFrangky that will offer the softness and elegance of a decent AMP template for my friend in my blog. At number 12 there Blanterde will be a burning spirit with a blend of red and white that will wrap nicely your all blog buddy. This one template is also designed to appear minimalist and clean, there is only a white wana and a little red line as a barrier. For buddy who likes the look of the box then teplete this could be an option with the priority in the plot in the picture box box. His name sometimes makes Confused, but it appears quite simple and neat if compared with other amp templates. This template is similar to droidbuzz in terms of appearance and even Almost the same so for my friend who would try to silhkan. One more template that gives my friend SEO features will be a good choice for your blog template buddy, curious to try? This template is like Big Brother from AMPnews template made by goomsite as well, of course with new features that have been added by creator. This template is very similar to droidbuzz blanoid and probably comes from the same 1 theme and in redesign. Last template Noname is actually paid but there is a divide for free so it can be downloaded many people.